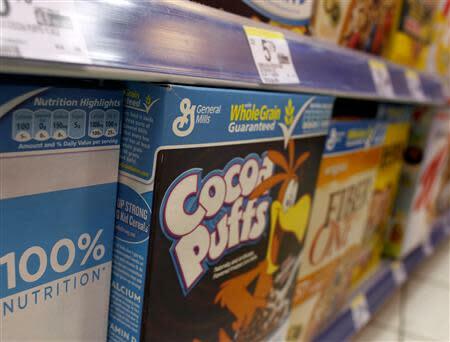 (Reuters) - General Mills Inc reported lower quarterly earnings on Wednesday, but the maker of Cheerios cereal and Progresso soups said sales rose due to the addition of new businesses. Net income fell to $459.3 million, or 70 cents per share, in the first quarter ended on August 25 from $548.9 million, or 82 cents per share, a year earlier. Excluding special items, earnings per share rose to 70 cents from 66 cents. The results met the analysts' average estimate, according to Thomson Reuters I/B/E/S. Net sales rose 8 percent to $4.37 billion. The company said the addition of new products such as Yoplait Greek yogurt and Pillsbury gluten-free dough in the previous year contributed 5 percentage points to sales growth. These products were gained through the acquisitions of Yoki Alimentos in Brazil and Yoplait International last year. The company affirmed its fiscal 2014 outlook of $2.87 to $2.90 per share, excluding special items.